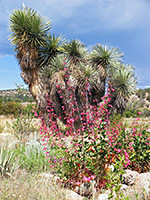 One of the more remote NPS national monuments in the Southwest, Gila Cliff Dwellings lies deep in the mountains of the Gila National Forest, surrounded on all sides by wilderness areas, over an hour's drive from the nearest town on steep, winding roads, and situated well away from main cross-state routes in New Mexico. The monument is a small site of just 553 acres, containing the ruins of interlinked cave dwellings built in five cliff alcoves by the Mogollon peoples between 1275 and 1300 AD, reached today by an easy one mile loop trail along a narrow canyon. So the time needed to tour the caves is rather less than the time spent driving to them, though the journey across the steep, forested hills and valleys is part of the attraction of the ruins, as is their out-of-the-way location. The nearby area has plenty of other features of interest including hot springs, more ancient sites, national forest trails and fishing along the Gila River. The journey to the Cliff Dwellings starts either from Silver City or the small village of San Lorenzo on NM 152. From Silver City, NM 15 heads north into the mountains, climbing gently at first to Pinos Altos then entering thick forest, where it becomes narrower and has many sharp curves and steep places, though without much traffic. 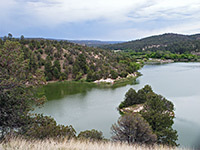 After Bear Creek, location of several primitive campgrounds, the road is straight for a while but is soon winding again, all the way to Sapillo Creek near Lake Roberts, where NM 15 meets NM 35 - a generally flatter, more traveled route that follows the Mimbres River southeast, most of the way to San Lorenzo. NM 15 continues north, now wider, along a ridge and past several high viewpoints of the Gila Wilderness; an impressive sight though in some ways the land is rather featureless, mostly miles and miles of rolling grey-green hills with just a few more colorful outcrops of red rocks, near the Gila River. 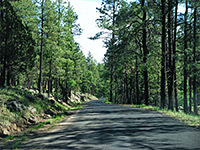 The final section of the road leads down to the river, crossing it at the junction of Main and East forks, then on to the settlement of Gila Hot Springs, which has a shop and a lodge. 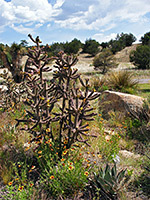 A short drive further along the flat valley floor reaches the national monument visitor center, located along a spur road on the right; this has comprehensive information about the local area, including a good selection of books. (Cliff Dweller Canyon), on the far side of the river. The fee to enter is $3 per person, paid to a ranger at the start of the path. The trail follows beside the narrow, overgrown, tree-lined streambed, crossing several times on wooden bridges and after 0.25 miles reaching a viewpoint of the dwellings, built quite high in the south-facing canyon wall. The path then climbs 180 feet, above the trees and back across the base of the cliffs to the caves. Rangers are in attendance to answer questions, and stop people climbing on walls or otherwise straying from the path, which passes through some rooms, past others viewable using ladders, then returns down a wooded hillside to the carpark. 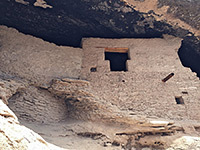 The five caves contain over 40 rooms and the site is inspiring enough but not quite in the same league as places such as Chaco Culture or Mesa Verde. The round trip takes less than an hour, and ranger guided tours are offered twice a day in summer, or once a day in winter. The only other easily reached ancient sites in the vicinity are along the short Trail to the Past, 0.5 miles before road's end, next to the Lower Scorpion Campground. This passes a panel of pictographs and one ruin at the head of a small canyon. 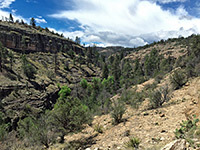 Several hot springs are found near the Gila Cliff Dwellings; a developed site in Gila Hot Springs village (entry $3 per person) and others reached by trails. The closest are 140°F Lightfeather Springs, located beside the Middle Fork of the Gila River, and reached by a path starting just past the monument visitor center; the trail follows the whole length of the canyon for over 25 miles but the springs are just 0.5 miles away. The path crosses the river twice, requiring wading of the foot deep water, and reaches the springs on the south side, beneath a small rock outcrop. Water emerges from an area of reeds and bushes forming a shallow, steaming pool that overflows into several artificial run-off pools, suitable for paddling as the water is cooler. Other locations include Jordan Hot Springs, 6.5 miles from the main road on a trail starting at TJ Corral, and Melanie Hot Springs, 1.5 miles along the Gila River near the Grapevine Campground. The nearest towns with hotels close to Gila Cliff Dwellings National Monument are Deming (93 miles) and Silver City (45 miles).